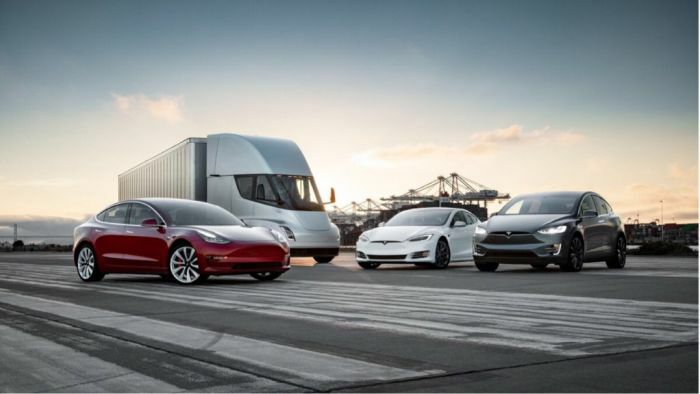 The entire Tesla lineup will now have three versions for each model from entry to the top of the line: Base, Extended Range, and Performance. All will use a 100kW battery pack to save, time, confusion, and money. They stopped making cheaper versions of S and X with the 75 kW battery pack. Lowest priced Model S will come in at a range and price point ready to compete against Porsche Taycan with 310 miles of range and MRP $85,000 USD. Lowest priced Model X will have 270 miles of range and MRP $88,000. Extended range on the Model S costs an extra $8,000 but you’re only getting 25 miles extra range. But you can upgrade at any time with an OTA update. Tesla is doing all this so that it can enable production of its $35,000 base Model 3. On January 18 Tesla said it will lay off 7% of its workforce, a second restructuring in seven months. This is supposedly being done to streamline to get costs within Base Model 3 territory. Add a motor, unlock the pack, pay another $19,000 and you now have the Model S “Performance” model, with the extended range capacity, the extra motor, and the extra horsepower and torque. For an additional 20 grand you get supercar performance with “Ludicrous Mode.” This all comes in at about $132,000 for S and about $137,000 for X. This should exclude extra charges like shipping, fees, taxes, etc. Model Y is coming very soon, and with Tesla wanting to sell a base version of its smallest vehicles at a price point of $35,000, simplifying assembly and pricing of its legacy 12 year old models will enable all this to happen. Cutting back production to make way for other models probably wouldn’t hurt either, as Model U follows quite shortly after Y, Semi scheduled for production this year, and we all wait for the next Tesla Super car the super halo, Roadster II. Production at Fremont is at capacity as CEO Elon Musk last year said according to the Drive, the plant is “jammed to the gills,” with an added tent mind you, so it looks like Model Y for now will be made in China, and unless Tesla can find capacity domestically, Model U might be assembled in China as well. Photos originally all come from Tesla’s website are all published here and all under Section 107 of the Copyright Act 1976, allowance is made for "fair use" for purposes such as criticism, comment, and news reporting. What do you think of Tesla’s new pricing structure and changes? Please let us know below! At these prices, obviously the buyer is paying for a large part or perhaps all of the 100kWhr battery . The Model X 75D lowest priced version is getting killed in Europe by the superior Jaguar I Pace . , base priced at $69K Creating a base Model X at $88K is not the ticket to stem the bloodletting (I Pace outselling base Model X 4 to 1 in Holland and killing it in Norway, etc). Tesla cannot possibly save anything on production costs by completely filling their battery case. I consider this basically fraudulent merchandising. Tesla is hopelessly overpriced in theU.S. with their diasapearing $7500 tax credit. The base Jaguar can have a net cost of $62K while the Model X base starts at $88K. And the Jaguar is consistently rated superior to the Model X. So how many braindead carbuyers does Musk think we have in this country? The Porsche Taycan has already sold out its entire first year's production, which will be greater than that of the Model S next year. They might even raise the planned production again and steal even more Model S sales (many buyers of the Taycan were Tesla owners) . In the U.S. it's not a fair fight - the Model S has no ability to compete on an even basis with the Taycan. And if Jaguar follows thru and creates a performance model, it will be far faster than any Tesla ludicrous mode vehicle and even faster than Tesla's $250,000 sports car. Tesla is claiming that the Model Y will vastly outsell the Model 3. It needs to, as the Model 3 sales are fading fast - Tesla couldn't even induce the sale of 3300 unsold Model 3 cars at the end of the year by offering inducements, $2000 discounts, etc. The Model Y is arriving way too late - not until mid 2020, by which time there will be a plethora of SUVs in its lower and upper price ranges, and in the U.S., all with a $7500 price advantage. Selling in the U.S., Tesla's largest market, will be impossible under those conditions, if they exist at that time. It will be difficult even if there are no govt tax credits. The Model Y competitors are getting very good reviews and have healthy sales and will be joined by 6 times their number by the time the Model Y finally arrives. And they already are priced lower than the lowest possible (but unlikely) Model Y prices. We can expect equal or, more likely, superior EV technology with respect to range and batttery recharge speed. Good article Al - excellent data - thanks! Can't really see how this will enable them to make a cheaper Model 3 and it seems recent financial reports are equally confusing according to analysts especially regarding low capex levels vs expansion plans. Time will tell...maybe more tax payers money is coming? That aside, 25 extra miles of range for $8 grand smacks of incredible greed, as they will have spent the money regardless (given battery production is outsourced) yet be unwilling to pass any realized savings onto consumers. Or maybe THIS is a strategy to fund cheaper Model 3??? I can't help but wonder what consumers would think of GM if they put a more expensive v8 in every Camaro but disabled 4 or 2 cylinders unless folks paid more money to them. I think a backlash would be of revolutionary proportions! Possible impacts of "Made in China" syndrome is another story, given seemingly continued US tax payers subsidies for the company et al? Wow, that is a LOT of speculation Kent. But with every bit of it being only speculation that Tesla will fail, you sound like a Tesla stock short-seller. The Jaguar iPace looks like a nice BEV crossover, but in many ways it is not a true competitor to the larger Tesla Model X. It is the new kid in town, and it may be a better fit for European roads and buyers than the Model X. The Taycan looks like an exciting BEV, and along with the Taycan's brother the Audi E-Tron GT, they will take back some of the customers lost to Tesla over the past few years. But building a BEV is a new prospect for Porsche/Audi, and hopefully they will not have bugs that plague first-year new cars. We can both guess at a lot of successes and failures with many new BEV models being announced now and for the near future, but it makes far more sense to wait and see until the new models are sold, and we are comparing actual street-driven, production cars against each other in real life. As for Tesla's new model configurations/line up it makes sense to simplify their offerings, while giving more bang for the buck.